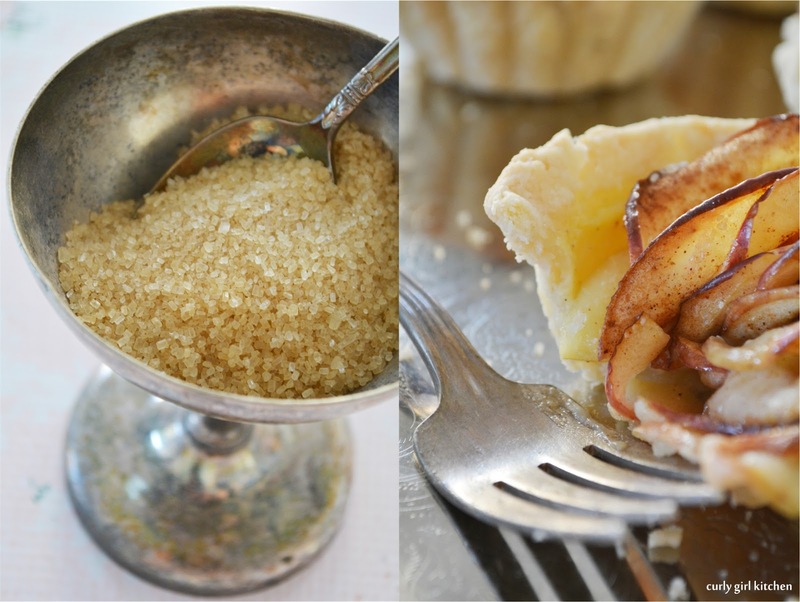 At Thanksgiving and Christmas, there were always two apple pies. One for dessert, of course, and one that my mom let us cut into for breakfast. It was a family tradition, that apple pie for breakfast, and there's still a part of me that thinks of apple pie as a perfectly acceptable breakfast. In a bowl with milk poured over it, it's like apple pie cereal. 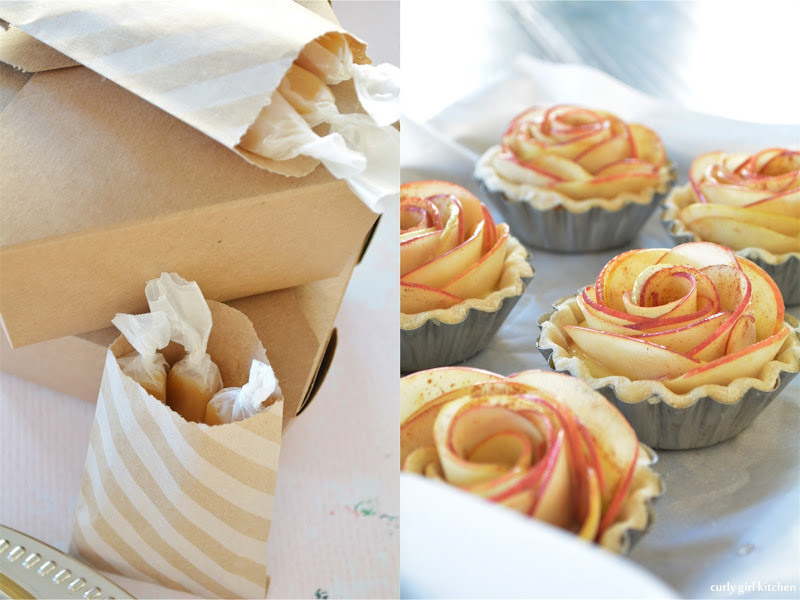 As I've recently discovered, there's more than a few ways to make an apple pie, and these little apple rose tarts might be the cutest things ever. 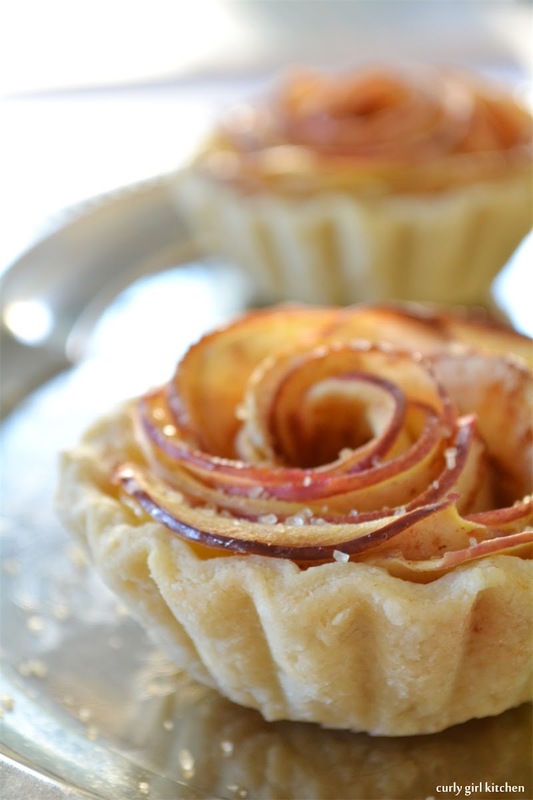 Very thinly sliced apples are laid in a row, each slice overlapping the next, then rolled up to resemble a rose, and nestled into a mini pie shell. 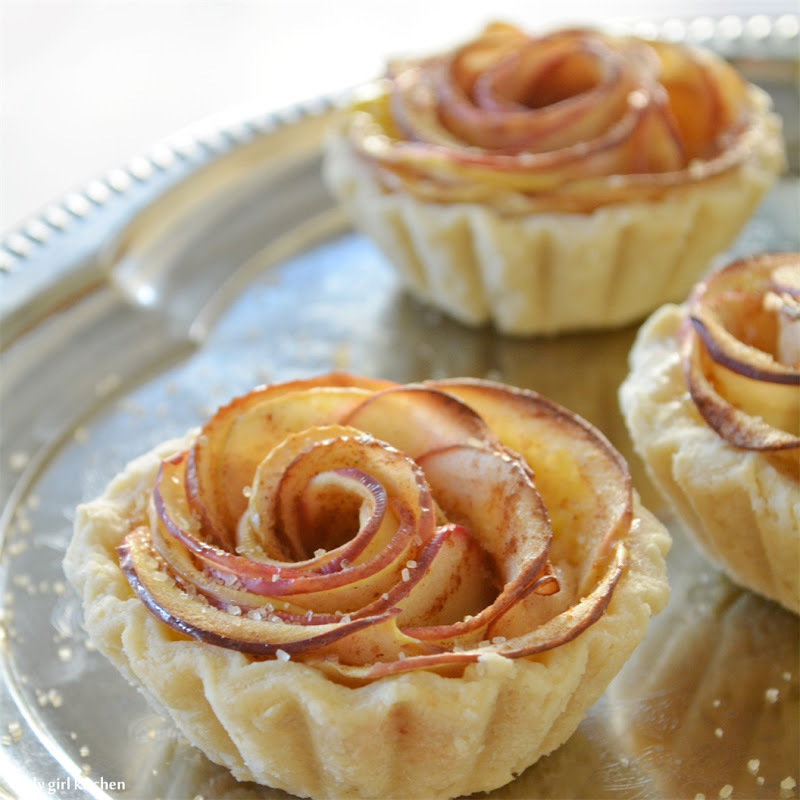 The bottom of each tart is filled with a spoonful of custard, which holds the spiral of apple slices in place as they bake. 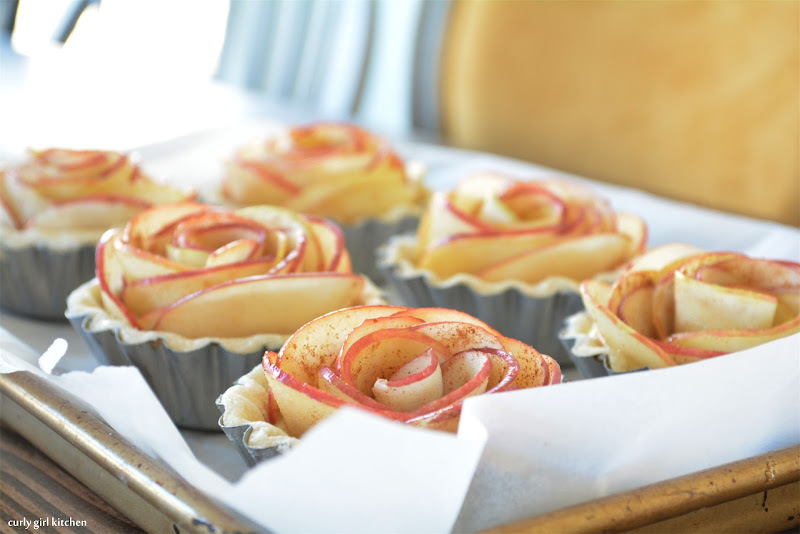 The pastry bakes up golden brown and flaky, and the apples are warm and soft in the creamy custard. A sprinkling of coarse sugar adds glamorous sparkle to each tart. 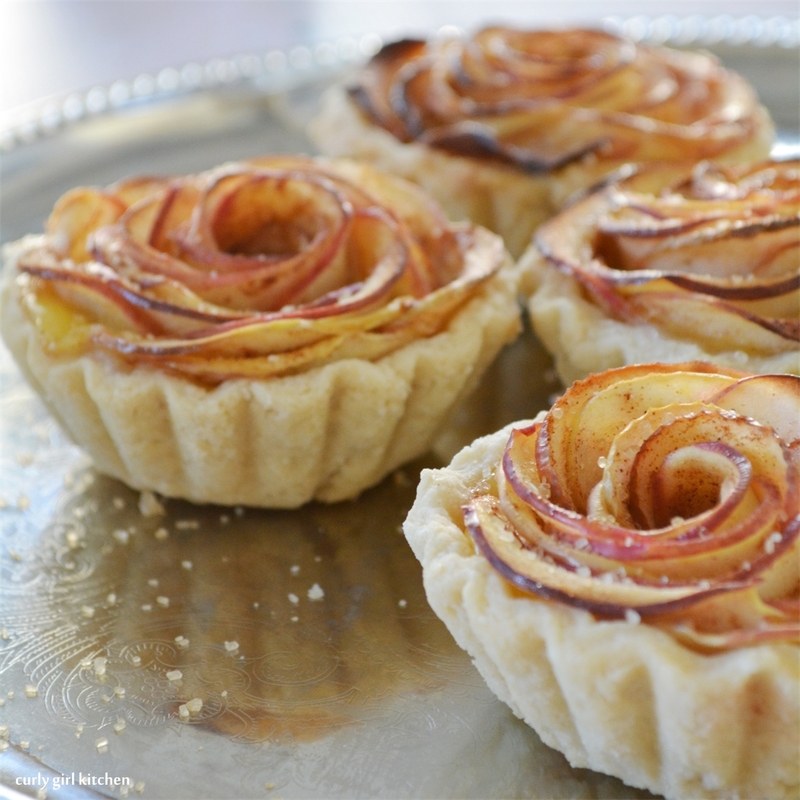 Each little tart is just a few bites of apple pie goodness, and I wouldn't judge one bit if you made them for breakfast. You'll need 8 individual tart pans (mine are fluted, with a base diameter of 2 inches and a top diameter of 3 1/2 inches), or you can use a standard-sized muffin pan. Note that because of the custard in the bottom of the tarts, the crust will soften by the second day, and start to get soggy, so these are best eaten the same day they're made while the crust is nice and crisp. 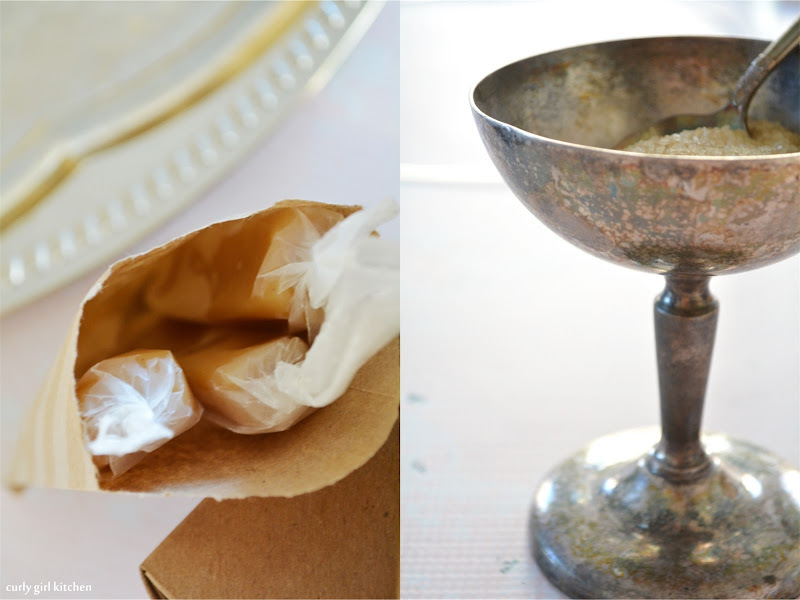 In a bowl, combine the flour, sugar and salt. Cut the butter in with a pastry cutter until the butter is the size of peas. Add the milk and toss to combine, then turn out onto the counter and use your hands to pull the dough together into a ball. Use a little more flour and roll the dough out to 1/4 inch thick. Cut into 8 circles with a 4-inch cutter, gathering up the scraps to roll those out as well. Grease the tart pans and gently fit the circles of dough into the pans. Freeze for 30 minutes. 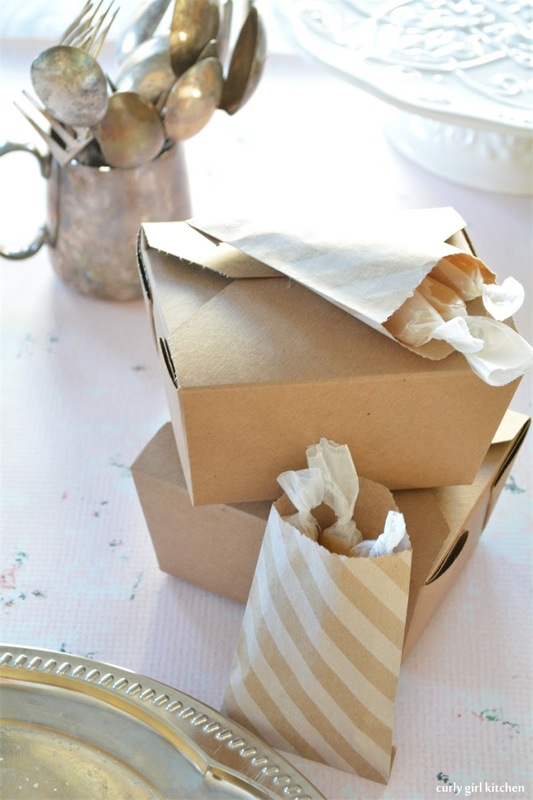 Preheat the oven to 375 and line a baking sheet with parchment paper. Set the tart pans on the baking sheet. If you don't want to make custard, you could also use a spoonful of store bought jam instead - apricot jam, or even apple butter would be nice. Spoon about 1 1/2 tablespoons of custard or jam into each tart shell. Cut the apples into fourths and remove the cores. Use a mandolin to slice the apples into very thin translucent slices. Lay the slices on a baking sheet, drizzle with the lemon juice and sprinkle with the granulated sugar and the cinnamon. Lay 12 or so apple slices down in a row so that they overlap, and roll up from one end to the other into a rose and place in the custard. 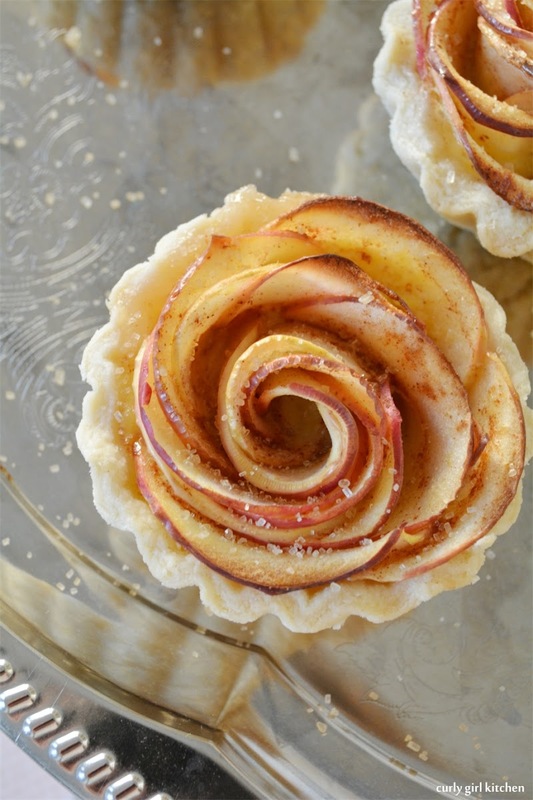 Add a few more apple slices around the edges if needed to fill out the rose. 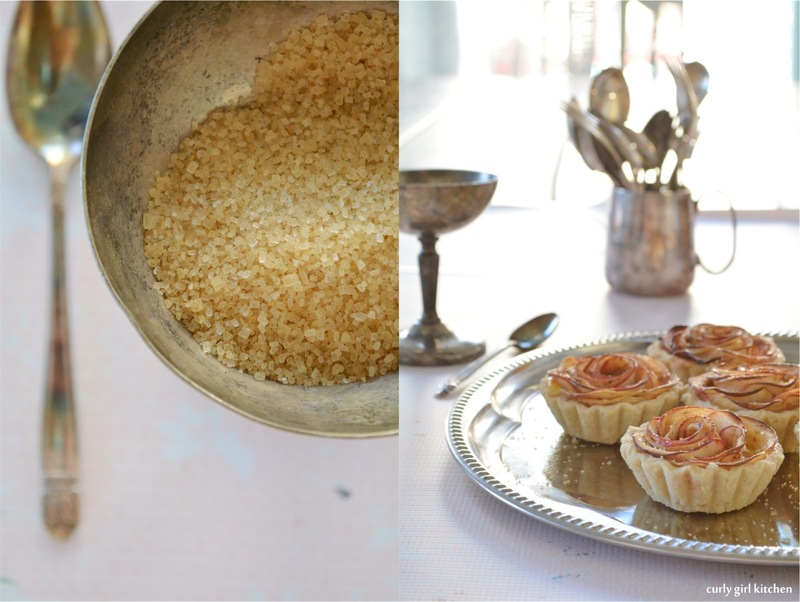 Bake the tarts for 35 minutes. Let cool for several hours before trying to remove the tarts from the pans. 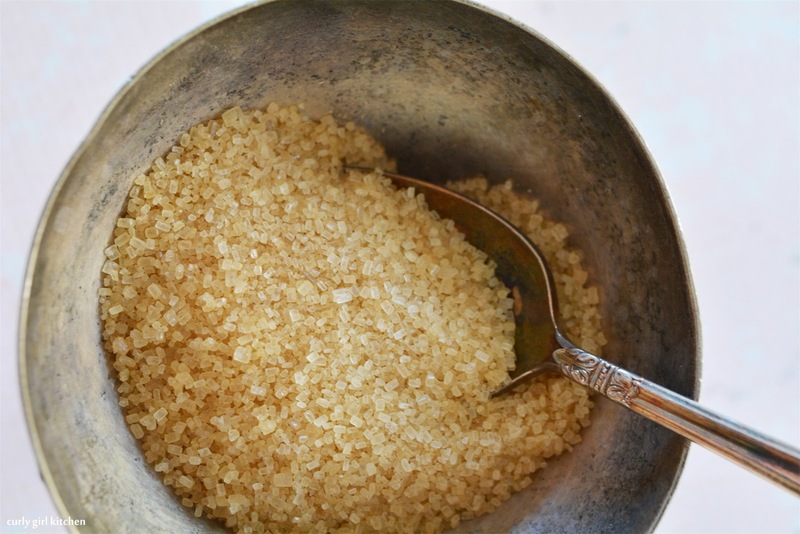 Sprinkle with the turbinado sugar, and enjoy warm or at room temperature.